Voice-over-Internet-Protocol (VoIP) is an emerging technology that allows telephone calls, faxes, or overhead paging to be transported over an existing IP data network topology. With advances in technology, it is now possible to carry voice and data over the same networks while still catering for the different characteristics required by voice and data. This provides for the addition of new voice communications products without the need for installing new cabling. 1. How do I connect to a specific VoIP products on the LAN or WAN? VoIP network devices convert a dialed number into an IP address and transmits it over the IP network. Simply dial a 2-digit extension and you are connected to specific intercom station, handsets and paging speakers. You may also dial group numbers and/or all call paging zones. 2. How does a Ring Down application circuit work? When using Ringdown it is not necessary to dial any digits. Merely go offhook with intercom station or telephone handsets and connection is automatically established through the LAN or WAN. Ringdown communications is either point to point or point to multi-broadcast. 3. Is there any voice delay? The delay usually occurs when there are an excessive number of router hops. Valcom testing has demonstrated that in most typical LAN/WAN applications there is little delay to affect reliable operation. 4. How is the voice quality? In order to operate efficiently, voice is digitized and then transmitted. High quality voice transmission speech encoding/decoding conforms to industry standards, which assures natural sounding speech rivaling that of traditional wired systems. 5. How are fax messages transmitted? Fax signals are transmitted using conversion to IP packets. The data is routed by TCP/IP. FAX transmissions are handled in the same manner as voice calls. 6. Is there any possibility of voice IP packets being discarded or lost? A voice packet is transmitted by UDP/IP. When there is network congestion, packets may be lost. It is suggested that routers with a priority control function be used in VoIP networks. 7. How do i set up VoIP products to operate on the network once preliminary installation is accomplished? All VoIP products are provided with an easy setup network programming tool. Simply plug in all VoIP products to existing LAN or WAN connections then use programming tool from any PC on the network to setup. Tool provides automatic detection of Valcom VoIP products and configures them for customer applications. Once setup IP products function stand alone without the use of the program tool. 8. What is the size of a voice packet? A voice packet is composed to 244 bytes of voice and control data along with 24 bytes of TCP/IP overhead for a total of 268 bytes. 9. What bandwidths are necessary for voice and fax transmissions? The bandwidth used is automatically configured during unit installation. In an example of on configuration, voice is digitized to 64 Kbps. In addition, a 5.7 Kbps header is added. The required bandwidth is about 140 Kbps per channel. This includes the packet header. 10. Will VoIP products operate if the network servers go down? As long as the routers and hubs are operational Valcom VoIP products continue to operate. They do not require the servers to be operational in order to function as intended. 11. Do VoIP solutions require dedicated wiring for operation? Valcom IP products connect to the nearest network drop in any building or location. Connections are typically made in network cabling closets or device drops found in any area of the building. There is no need to run dedicated new wiring for operation. Remember that a VoIP product is required to send the signal into the network, at the remote location another VoIP product is required to receive it. Valcom VoIP solutions eliminate wiring by using the existing data infrastructure to connect buildings in multi building campus environments or facility wide across town, across the state or around the world. 12. How do I connect a handset to my network for point to point voice communications? The VIP-810 Networked Station Port Adapter is used to connect any analog telephone to the nearest network drop. Ringdown operation provides call routing to the location were the call is to be answered. Multiple VIP-810's can be associated with a single receiving point. Calls may be initiated from master telephone station by dialing 2-digit remote telephone station number. 13. How do I connect an intercom Door Phone station through my data network? Intercom station operation is provided using the VIP-810 Networked Station Port Adapter. Simply wire new remote station to nearest network connection point. Ringdown operation connects calling party to appropriate responding master station. Multiple doorphone stations can be placed throughout the facility all reporting to a single receiving destination. Master telephone station can call any remote intercom station using 2-digit location number. 14. Can Doorphone Intercom stations be used indoors and outdoors? Valcom Doorphone V-5324004 is designed to be rugged and reliable. Their weather-resistant construction makes them ideal for outdoor installations. Used indoors for assistance call in stations they provide an attractive and durable finish resistant to commercial use. 15. What VoIP solution is used to support new building paging applications? The VIP-800 Networked Page Port Adapter is the product used when one way paging is required. It can connect both Valcom traditional powered speakers and constant voltage speakers using 25 and 70 volt amplifiers. One VIP-800 is required for each building or specific zone. Application may be specified for all call or zone paging. 16. I want a campus emergency paging system to provide facility wide all call and zone paging; what products should I buy? All master paging location use a VIP-810 Networked Station Port Adapter with a telephone handset, at each remote building or zone use a VIP-800 Networked Page Port Adapter. Use appropriate paging speakers throughout the buildings to provide required coverage. If you want to access specific building or zones + all call paging use a telephone with dial pad at master paging location. To page a building dial specific 2 digit code for that building or area. To dial all buildings or zones dial "All Call Code". 17. 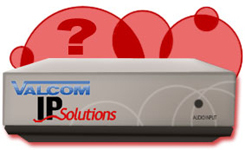 Will Valcom VoIP Solutions bog down my network when they are in operation? Valcom products use very little bandwidth while providing excellent voice quality. Our testing has proven that our products have negligible impact to network operations. 18. I have a remote existing building with a conventional 70 volt paging system, I would like to tie it in for facility wide all call; What product should I use? A VIP-800 Networked Station Port Adapter will support conventional paging system that has been previously installed. The output of the VIP-800 is tied into the input of the remote amplifier for operation. A contact closure is also provided to provide local muting or relay operation if required. Remember that another VIP-800 will be required at main paging location to transmit remote paging signal through the network. 19. How can I install a remote paging microphone without having to pull new wiring from our main location? Use a VIP-810 Networked Station Port adapter and connect paging telephone station to nearest network drop closest to the required location. You do not have to wire device all the way back to the main paging location. Let your data network provide the connection points. Remember that another VIP-800 will be required at the main paging location to receive the signal from the new remote microphone location. 20. I want to tie two remote PBX's together to eliminate leased line charges; What products do I need? The VIP-820 Networked Trunk Port Module makes it a snap to connect two or more PBX systems over the LAN or WAN. It provides station to station PBX access elimination the need for more expensive trunk connections that may be typically required by other providers. 21. Can I install VoIP solutions myself without having to hire an electrical contractor? Valcom VoIP Solutions have been designed for easy installation by users and contractors who have a basic knowledge of networks and low voltage wiring techniques. Valcom products are easy to understand and are shipped with complete documentation that provides simple step by step procedures. Valcom paging accessories are installed with common tools and operate with power limited power supplies using conventional twisted pair cabling topologies. 22. What kind of speakers should I use in a suspended ceiling environment? Users tell us that the V-9022 Lay in Ceiling Speaker is the best choice for quick installations and it looks the best. It replaces a 2x2 ceiling panel, eliminating the need to cut or align. Simply remove tile and drop in speaker. It's great for hallways and office applications. Use your paging system calculator tool to determine the number of speakers that will be required. This speaker consumes 1 power unit. 23. What kind of speakers should I use in large open areas or when the application calls for loud paging for emergency only applications? The V-1030C Paging Horn is the product of choice for open/large area applications coverage. This horn is ideal for large open spaces and those emergency only paging systems applications that need to provide attention getting messages with the least amount of devices installed. Use the Paging System Calculator Tool Horn Coverage side two to determine how many horns you will need. Horn consumes 6 power units. 24. Besides speakers and horns what else is required to complete a paging system application? Valcom speakers require power supplies to operate. The VP-6124 6 Amp Wall Mounted Power Supply is ideally suited for most applications. It provides up to 120 power units to drive speakers and paging horns. Battery back up is available using the VP-6124-UPS as an option. 25. How many wires do I need to run to each speaker or horn location for operation? Valcom powered speakers and horns require two twisted pairs to operate. 1 pair provides the audio signal, the other pair provides 24 VDC to operate the internal amplifier. Wire can be power limited permitting installation in plenum ceilings and exposed raceways. Consult your local wiring or building inspector for approvals and recommendations. 26. Do I need to run Valcom speaker wiring in conduit like most other paging systems? Valcom speakers are installed without using conduit. All Valcom speakers operate with twisted NON-shielded power limited cables. This makes installation a snap. Many of our customers use existing data cables to connect speakers in remote locations eliminating the need to add new conductors. 27. How hard is it to calibrate and balance speakers once system is up and running? Valcom speakers and horns are provided with individual volume controls. This is what makes our company and products unique. Users simply adjust volume at each speaker location to compensate for either room size or ambient noise conditions. If things change due to remodeling or different customer uses, Valcom speakers are easily changed without the need for replacement. 28. Do Valcom speakers sound good? Are they intelligible and clear sounding if background noise is a problem? This aspect is what really differentiates Valcom's products and company in the market place. Valcom's engineers design products that consistently outperform competitive products in all applications. Valcom's manufacturing ensures high quality and performance in the most severe job applications. From small office paging to large commercial and industrial occupancies, Valcom stands as a preferred supplier.